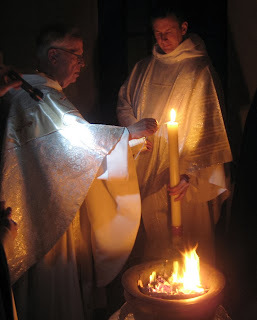 On Holy Saturday evening we have a Vigil service which begins with the lighting of the new fire and then the blessing of the Paschal candle. This beautiful ceremony is followed by the lovely chant, Exsultet, the readings from Scripture with their sung responsories, and then the glorious Mass of the Resurrection. All this input gives one a new appreciation of our gift of Faith and plenty of food for meditation for a long time. We nuns of Corpus Christi Monastery pray that each and every one of our family, friends and benefactors will receive many graces and blessings in this beautiful Paschal Season. Many years ago one of our Sisters found this lovely poem and it has become a tradition to read it in the refectory each Good Friday at the evening meal. However we have not been able to locate the source or the author. The Son of God is dead. On Holy Thursday we usually have a Seder Meal. This picture shows the lit candles at the head of the refectory where we celebrate by using the same foods that the Jewish people use to celebrate the Passover feast. These must be much the same as Jesus used at the Last Supper, the night before he died. There was the lamb of sacrifice, the bitter herbs, the charoset, the egg, and the wine. This ceremony helps us to remember our roots in the Jewish tradition. The Easter or Paschal Triduum, is the summit of the Liturgical Year. It is the celebration of Christ's Paschal mystery which begins with the evening Mass of the Lord's Supper on Holy Thursday, reaches its high point in the Easter Vigil with the Mass of the Resurrection of our Lord Jesus Christ, and closes with Evening Prayer on Easter Sunday. Therefore, we invite you to join us in celebrating the Liturgies of these Holy days! 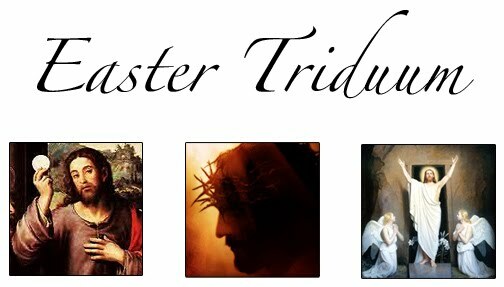 Celebration of the Lord’s Passion at 3:00 p.m.
Easter Vigil Service at 8:00 p.m.
Mass of the Lord's Resurrection at 8:30 a.m. This has been an eventful week. We had the feast of St. Patrick, which is a solemnity for us because he is the co-patron of our Archdiocese. Therefore the liturgy was transferred to Monday. So that day we had our corned beef and cabbage and our wonderful Irish hymns. 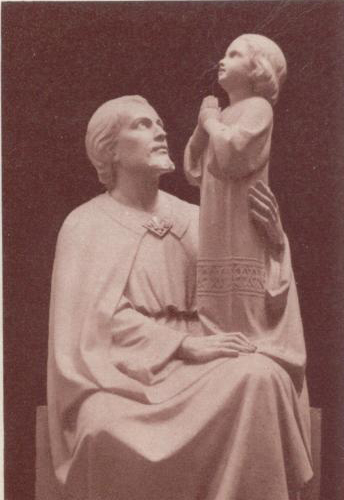 Next day was the feast of St. Joseph, patron of the universal Church. This too, is a solemn feast of the Church which we always celebrate with all the trimmings. 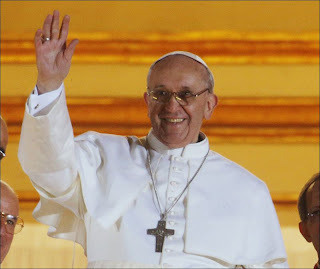 But this year it was a very special day because it was the inauguration day of our new Holy Father, Pope Francis I. What a magnificent occasion! We watched as the Vatican pulled out all the stops and set the whole world rejoicing in the gift of our first American Pope and Bishop of Rome. Pope Francis loves simplicity, and we did notice that in many little ways things were done in a simpler way than in past ages. But even so, it was a magnificent manifestation of the love and honor that our spiritual leader inspires among all the nations of the world. And now we are at the threshold of Holy Week. Just as we turn from the glory and triumph of the inaugural Mass to the solemn rites of Holy Week liturgy, so Jesus turned from the glory and triumph of Palm Sunday to the rejection and suffering of the Paschal Mystery. May we follow Him in His Sacred Passion this week, and reject all that is sinful in us, in order to share in His eternal glory in the Resurrection. Here we are at the mid point of our Lenten Season. 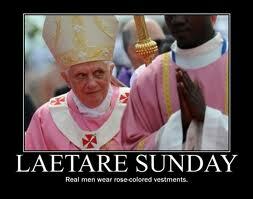 This Fourth Sunday of Lent is called Laetare Sunday because the first word of the opening verse at Mass is Rejoice, and the Latin translation of that is Laetare. Some people wonder why we should have - in the middle of Lent, of all places - a Sunday for rejoicing. But think for a moment, every coach, trainer, parent, and teacher, is concerned for the flourishing of their protege. Knowing that it is not good for the mind, heart, or body to be stretched for too long a time without respite, they prescribe a time of rest and relaxation before once again exerting effort to attain the goal. 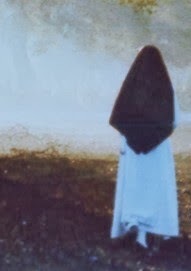 Holy Mother Church is thus concerned for us during the time when we have been making strides in knowing ourselves, combating our weaknesses, striving to practice virtue, making sacrifices, and praying more earnestly. And so she has woven into our Lenten Liturgy this Laetare Sunday when we relax our efforts for a short time to get our breath and be renewed for the weeks ahead. On this day the priest at Mass wears rose colored vestments to signify this relaxing, since the more severe purple which is used for the rest of Lent indicates our penitential works of the Season. In our monastery three of our Sisters have consecutive birthdays on March 8, 9, and 10. Ordinarily we would not be celebrating in Lent but since it is Laetare Sunday and a generous benefactor has donated pizza for the occasion, we can rejoice with our Sisters as we wish them a Happy Birthday. 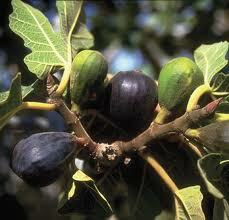 The Gospel of the Third Sunday of Lent tells us about the land owner who goes out to check the fig tree in his garden. He finds leaves but no figs. 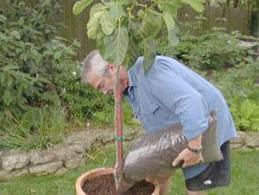 Since this has been going on for three years, he tells the gardener to cut it down and plant something that will produce fruit. But the gardener asks for a little more time - just one more year. He will cultivate it, water it, fertilize it and give it loving care. He knows it is the last chance for this poor tree, but he will work with it in hopes that this year it will produce figs. 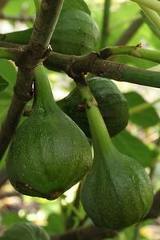 That little fig tree is you and me. Are we producing the fruit that we have been planted for? We have been given this Lent as a time of repentance and conversion. 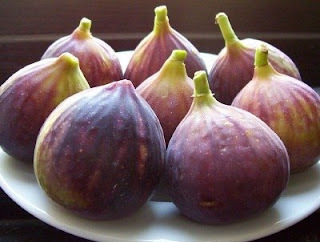 Our loving gardener is God and He wants to help us to produce. He will water us with His grace each time we ask Him. He will dig around us, sometimes shaking us up in our complacency. Things may get a little rough. It might be a serious illness, a death in the family, the loss of a job, a broken relationship. When these major upsets come, let us consider them as the cultivation necessary for our growth. If we put down our roots firmly in the depth of God, we will stand firm even when we are shaken. Then there is fertilizer. This is not a pleasant experience either. It is dirty, smelly, uncomfortable. 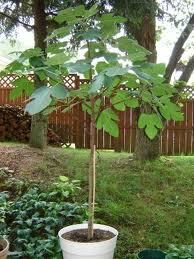 But it is necessary for the tree to flourish. When we must endure the little uncomfortable experiences of life, let us think of them as our fertilizer. They may be a head cold, a noisy neighbor, a dinner not to my taste, missing a plane, a computer crash, or a million other annoyances in daily life. Let us allow them to do their work in feeding our souls with the nutrients that we really need to product luscious fruit.